Today is National Radio Day, and yesterday, August 19, was National Aviation Day. The two days celebrate the development and technological advancements in aviation and the invention of the radio. While it is most likely coincidental that both holidays fall back-to-back, in terms of 1930s industrial design, this pairing is meant to be. Ronald Reagan as a WHO Radio Announcer in Des Moines, Iowa, 1934-37. Courtesy Ronald Reagan Library. The years between World War I and World War II were the Golden Age of Flight and the Golden Age of Radio in America. During these decades, affordable, safe, and comfortable long distance plane trips became a foreseeable travel option for the greater American public. Similarly, the affordability of the radio brought families across the United States together for regular nightly programming and entertainment—essentially bringing the world into their living room. With both the skies and airways now within reach, the fascination with rapidly developing technology, speed, and motion became hallmarks of the era. Artistically speaking, this era is one of my favorite periods in terms of the decorative arts. The emergence of flight had a profound impact on the design of many household and consumer goods during the interwar years, and radio encasements often reflected the Machine Age aesthetic of the 1930s. Prominent industrial designers of the day embraced America’s love affair with flight and successfully blurred the lines between art and technology with of-the-moment consumer products. Good design sells; therefore, it is no surprise that for the radio—one of the most prominent fixtures in the 1930s American household—overall design aesthetic often dominated the purchasing decision of a design-savvy consumer. A TWA Douglas DC-3 is prepared for takeoff from Columbus, Ohio, in 1940. Photograph of a young girl listening to the radio during the Great Depression. Franklin D. Roosevelt Library Public Domain Photographs. If you’re looking for a creative way to pay homage to these two holidays, take note of these aerodynamic gems on view at the Dallas Museum of Art that incorporate characteristic elements of streamline design, including horizontal banding, smooth exteriors, and the use of modern materials like chrome and plate glass. Each object suggests the concepts of speed and movement while stylishly capturing a moment in decorative art and design history when the worlds of aviation and radio effortlessly collide. Take a look at the 1933 “Air-King” radio (model 66) designed by Harold Van Doren and John Gordon Rideout. The form of this radio is a play on the motif of a skyscraper, with its stepped shape toward the top; however, the circular glass plate on the façade with showing AM and FM broadcast band numbers, combined with the tuning and volume knobs, remind me of a cockpit’s control panel. Don’t miss this “Bluebird” radio (model 566) designed by Walter Dorwin Teague and manufactured by the Sparton Corporation in 1934. The name alone embraces the notion of flight and is enhanced even further through streamlined design elements. Here, the straightforward use of circles and horizontal banding set against the plate-glass backdrop seems to mimic a single engine propeller plane’s nose and wingspan. I imagine a plane flying gracefully through the clear blue open sky, transporting the avid listener to new destinations through the magic of radio. To learn more about how the Machine Age influenced art and design in America, visit the Dallas Museum of Art’s upcoming exhibition Cult of the Machine: Precisionism and American Art, which will open to the public on September 16. Jennifer Bartsch-Allen is a Digital Collections Content Coordinator at the DMA. This week, the Center for Creative Connections installed an array of communication devices dating from 1909 to 1972. These objects demonstrate the dramatic change communication has undergone over the past century: devices have decreased in size to become more portable, while our ability to communicate with each other has become more immediate. Before texts and tweets, messages were sent and received by post or telegraph. Imagine sitting at a desk in the early 1900s and using these beautifully designed, handcrafted tools. Perhaps you are opening an envelope or dipping your pen in an inkwell to compose a letter to a dear friend. “Snail mail” would have been the only way to correspond with your out-of-town friends and family. According to the U.S. Postal Service, from 1926 to 2001, the number of items mailed steadily increased from 15 million to 103 million. However, this number had decreased to 62 billion by 2015. Today, instead of waiting days to send and receive a letter, we can simply send a quick text or email that arrives in mere seconds. One of the first cameras to be marketed to women, the Kodak Petite was produced from 1929-1933. It was sold in a handful of colors and its small lightweight design made it easily portable. Today, anyone with a smartphone has access to camera at all times. It’s interesting to note that when the Kodak Petite is closed, it is roughly the size of a modern day smartphone. Until the birth of radio and television in the 1920s, information, news, and entertainment were dispersed to the masses through printed materials like newspapers. This 1930’s Bluebird is a small personal radio, similar in color and design to the larger Nocturne radio in the Museum’s collection. Though this elegant radio may have been outside the budget of most living through The Great Depression, the medium itself remained an important aspect of everyday life in the early 20th century. The way we listen to music has certainly changed today. Instead of waiting for our favorite song to come on the radio, we have access to podcasts and programs like Spotify, which make listening to shows and songs possible practically anytime. The Ericofon was the 1950s version of an all-in-one device. This one-piece phone combined the once separate dialing component with the listening/speaking component. At the time, it’s thirteen ounce weight was a huge improvement on the typical five or six pound telephone. Reminiscent of an astronaut’s helmet, the JVC Videosphere’s spherical design came on the heels of the first moon landing–doubly significant because the landing was televised. The Videosphere was one of the first televisions meant to function as “a second set” for a household. Its small size also indicates that it was designed for use by an individual rather than a group. Perhaps what is most striking about all of these devices is that each of these modes of communication is readily available today in one small, handheld device. Stop by the Center for Creative Connections to see these works of art in person and consider how communication has changed in your lifetime. Though the weather is getting cooler and the leaves will soon be falling, here at the Museum, the Center for Creative Connections is in full bloom! In conjunction with the DMA’s upcoming exhibition Bouquets: French Still-Life Painting from Chardin to Matisse, we have updated our monitor wall to display visitor submitted photographs of flowers. We’ve also stocked the Art Spot with supplies to make flowery creations. Stop by and make a flower to add to our garden of creations, or join our Flickr Group, DMA In Bloom and submit your flowery photos to have them displayed on the monitor wall. We look forward to your blooming creativity! The chance to intern at the Dallas Museum of Art this summer has been incredible, and the work done in the Center for Creative Connections creates the perfect opportunity to apply my specific research interests. I’ve been studying what’s typically called “cultural capital” for several years now, and it refers to individuals’ accumulation of literacies, skills, and privileges that result from economic status, education levels, or race. This concept is thought to permeate all aspects of society, particularly in institutions as established as the museum, and holds implications for the equitable treatment of visitors and the validation of their experiences. A guiding question for my own work is: How can all visitors overcome the expectations created by cultural capital and bring their own experiences to the interpretation of works at the museum? In recent years, many websites and software applications (apps) have been created to allow for unhindered cultural production by users from all walks of life. Often these programs also allow for social media interactions, creating unique communities bound by technology. If this user-friendly type of creativity could be adapted to gallery activities, it may spark the interest of underserved visitors. As part of my summer project, we held a trial run of these activities as part of a “Pop-Up Tech Spot” for 2 hours during July’s recent Late Night Art Bytes program. 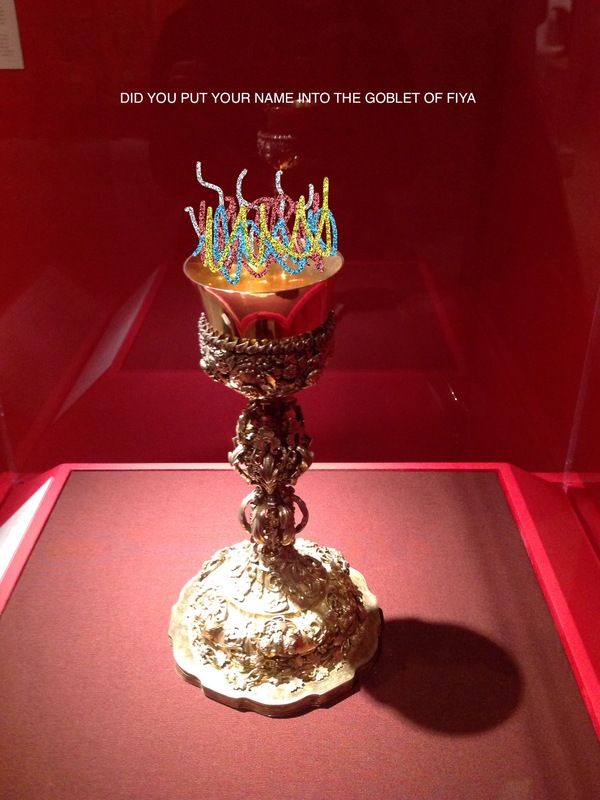 To capitalize on smartphone technologies and trends in social media, we created a Snapchat activity that allows visitors to recontextualize the works on display at their own pace. Visitors were invited to take photos with their smartphones using the app, and then to draw or type atop the images to make it their own. By setting up an account for the museum (add DallasMuseumArt as your friend), we were able to receive and save visitors’ submissions. The evening yielded 28 different photos created by 10 visitors, many of which were entertaining interpretations of the permanent collections. For those who were uninterested in maintaining a Snapchat account, there was an alternate option for editing photos of works on display. The DoodleBuddy app in place on the iPads was available for visitors to borrow from the activity cart, and had similar creative capabilities. Users could snap a picture and then add their own touches to a work. This activity was the most popular that evening, as some 22 visitors worked individually or in pairs to create and save 14 new images. When finished, masterpieces could be saved to the museum’s iPad (to be later uploaded to Flickr) or emailed to the visitor for their own use. The least popular activity for the night was a mapping activity that utilized other capabilities of the DoodleBuddy app on the iPads. Visitors could borrow the iPads with the program, this time drawing and/or typing atop a preloaded map, to chart the works within a particular gallery. 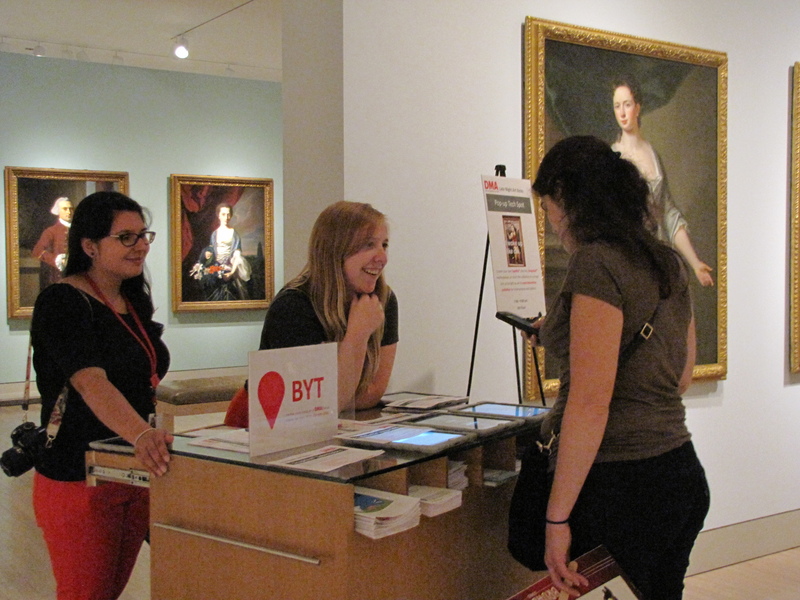 Because of its proximity to the cart’s location near the entrance to the American gallery, the trial program utilized the works from a gallery of Colonial Art of the Americas, allowing visitors to find the origins of works from Central and South America. One enthusiastic visitor was able to use the map to teach a friend about her home in Paraguay, and pointed out political and economic tensions that continue to this day. The use of music in the galleries is nothing new, but allowing visitors to create playlists that is accessible both within and outside of the galleries was a novel opportunity for most. Familiarity with the app was likely a hindrance for many who stopped by the activity cart, but 5 visitors decided to opt for the musical program on their smartphones or the provided iPads. When creating the playlist, users simply included “DMA Late Night” in the title to allow other Spotify members the chance to search, play, or follow playlists created in the museum. Gallery experiences translated through song can be accessed from anywhere, or even played back in the galleries to create a community of listening visitors. Overall, the evening was a bustling hit. The activities piqued the interest of several disengaged visitors, and allowed them their own space to create something new. Passersby received handouts about the Snapchat submissions to allow their continued access to the activity, and the iPads were put to excellent use by up to 5 visitors at once. Difficulties encountered included the length of explanation required for several of the apps (many visitors were unfamiliar with Spotify), and some troubles using the DoodleBuddy camera feature. Better instructions or fewer choices should help minimize these issues. Testing these activities also allows us to consider how–or if–these programs could be utilized in conjunction with the Pop-up Art Spots already in place in the galleries. For example, the mapping activity could easily be translated into an activity for the Indonesian galleries, while the Spotify app may be put to better use in the contemporary collection. Snapchat and DoodleBuddy image editing activities may also benefit from utilizing more focused prompts, inviting visitors to submit photos for a single object or particular theme. I’ve had a blast adapting apps for gallery activities. Hopefully this is just the beginning of “share-able” cultural production used in the galleries, and I’d like to extend a huge wave of gratitude to all those who helped me get things in motion! While internet memes are creative and fun, we can push our students to use technology and social media in a more artistic way. Many of them are already using these technologies, so it’s just about giving them a little direction and guidance to go beyond their clever memes and explore their artistry in a 21st century style. Here are a couple of lessons that use Instagram as a way to explore this idea of creating and sharing digital art. 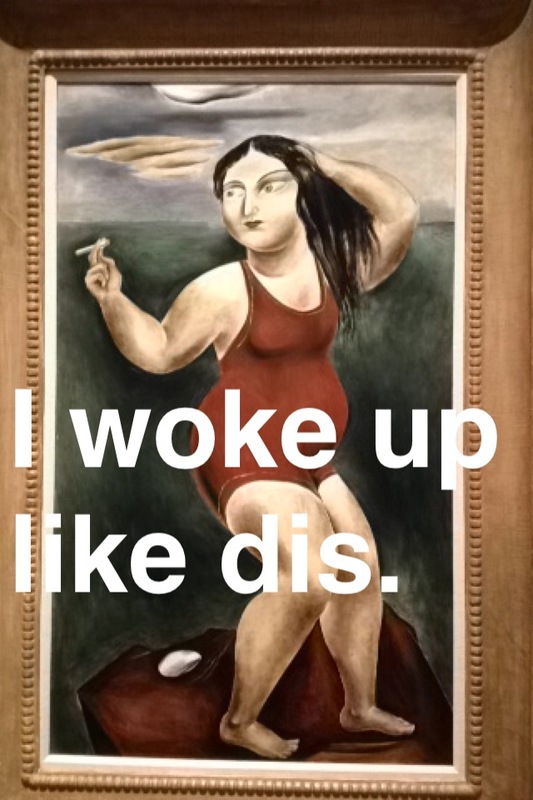 Memes can be a fun, relevant tie in to the idea of appropriation in art history. Start a lesson discussing Andy Warhol, Sherrie Levine, or Richard Prince, then compare their processes to current memes. Let students discuss how these are the same or different. Using Instagram, take and share a photo. Let the students take turns appropriating your image, almost like a game of visual telephone. Each student will appropriate the previous student’s image, modifying it slightly. You can use a hashtag to keep track of the images submitted. A few of the DMA education staff members tried this out using the hashtag #DMAofficeAPPROPRIATION. Take a look at how our images transformed over time. Want to learn more about this topic and get more lesson plan ideas? Danielle Schulz and I are presenting at this year’s Texas Art Education Association’s annual conference. The conference will be held in Dallas next month, so make sure you register soon! Our presentation is Saturday November 23rd at 1:00 pm–we hope to see you there! I found this great description of Tiny Thumbs on your Facebook account and I think that sums up “what” Tiny Thumbs is really nicely, but my next thought is, how did Tiny Thumbs come to fruition? The idea of Tiny Thumbs came about as[co-founder] Kyle [Kondas] was teaching a class I was involved in called “Games and Gallery Art” where we really sought to tackle the idea of how to show games in an artistic space and what is gained from doing so. We were both inspired by the work of similar shows like Baby Castles – and the idea that we really had a desire to get people off of their computers for a bit and really connect with people, and not just gamers, but we really felt like independent designers could learn so much from talking with people outside of their current circles. In your Tiny Thumbs description, it specifically mentions the “indie game scene.” Why are indie games important? I’ve always seen indie games as the ‘art house’ of videogames, it’s the place where people can push the boundaries of interesting design and art and help to get to the core of what makes a game a game. Of course, not all indie games have such a lofty goal, but they still give the reigns of creation to a greater variety of people and that can only lend a larger amount of voices to the field. I think it’s the ability for ANYONE to make a game, for interesting ideas and experience to show up and change how I feel and view games on a weekly basis that makes me love indie games so much. It’s people, making games because there is a spirit inside them that drives them to do it. 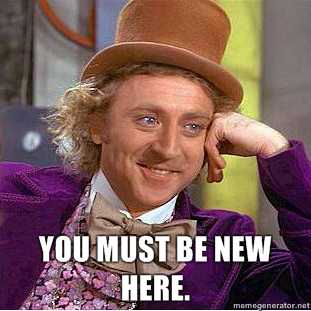 People who HAVE to create games, made for a community that is passionate to play them. Other than being under the “indie game” umbrella, is there anything else that connects the content that you choose for your shows? Not really! For our first few shows we wanted to take games of exceptional quality and bring them out of the “one person, one computer” context that they were sitting in. Our goal was to help spread the word in Dallas that there was a place for games of quality to be shown. Now in the future we would love to do themed shows, but for now we are picking games of interest and quality to start a dialogue and really find out what Dallas needs from our show. Recently there have been a surge of articles asking whether video games are art. MoMA has added video games to their permanent collection, and the Smithsonian has created an exhibition about the evolution of video games as an art form, which is scheduled for a two and a half year tour around the United States. Assuming that you are on the “yes” side of the debate, can you tell me more about why you feel this way? Are games art? Haha, this is a deceptively difficult question, as you really have to nail down why the question is being asked, what kind of information is trying to be achieved – do I think that games have the potential to have strong artistic statement? Yes. Do I think that games can have aesthetic properties that can inspire and enthrall? Very much so. Often when the question is asked, it seems to me that the real question that is trying to be asked is “can we take games seriously” and for that question I would say emphatically yes. We’ve only just begun to understand how interaction can change the stories and experience that we craft, and what games really mean to people. Video games have only been around for about 50 years (give or take) but in that time we have gone for dots moving along a screen to games like Journey which have breath taking vistas. So are games art? Perhaps, but more importantly – games NEED artists and art viewers to help them become the fullest experiences they can be. Looking forward, what’s next for Tiny Thumbs? So many things! We are currently in talks for at least two more future shows this year and are excited to have many more events in the future. If everything goes right, we would love to have a monthly show – traveling around venues in Dallas, sampling the flavors of this city and hopefully making the show something that the city can be proud of! Stop by tomorrow night for Late Night at the DMA. Kyle Kondas and Robert Frye’s Tiny Thumbs video arcade will be available for you to play and observe from 8pm – 11pm in the Center for Creative Connections’ Tech Lab.